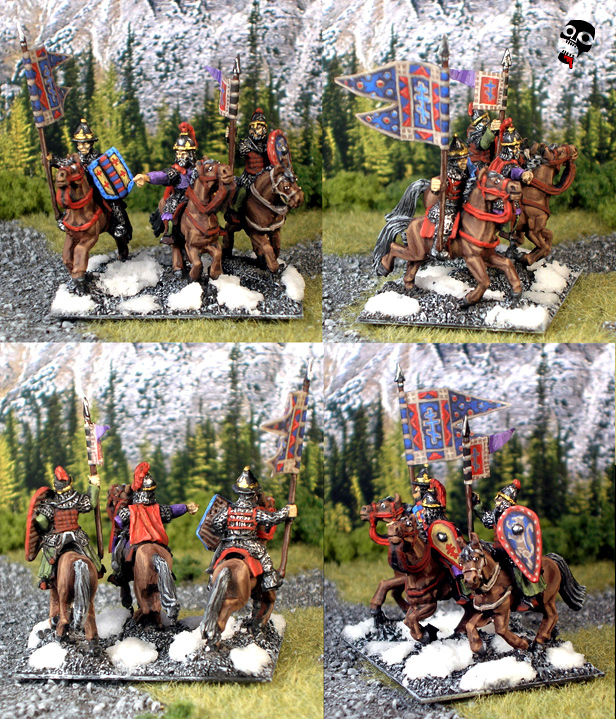 My third complete DBA army, the III/78 Early Russians were purchased for some Mongol Invasion action! A nice army to paint, lots of cavalry, nice big shields to paint (all freehand, no decals) shield designs onto. No real need for patterned silk like those Andalusians. Of the two other armies I have, this one apparently faced off against the Vikings. The blade verse cavalry battle is an interesting one so we will see how Steinthor fares in the east! I figured I would start off this DBA army with a bang! The general's element is the first one, and it turned out well. I wanted to go with something a bit different from the standard jesus head banner, so I did the colourful deal there. It is historically based, as are the shields. Notice though how these Old Glory general types seem to follow a pretty consistent pattern by comparing this element to my Andalusian General Element! This is one of my favourite units/elements in the army so far. The one thing that doesn't sit perfectly with me regarding these figs is the shields; there are too many round ones! 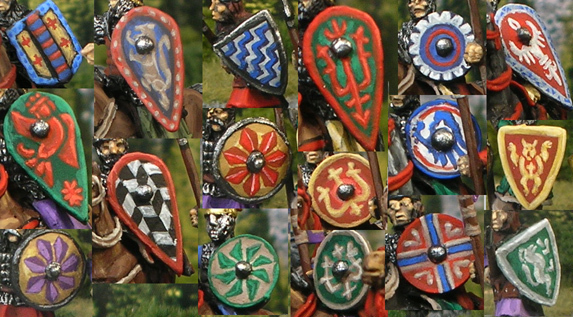 I can't find enough examples of round shield pattern examples to base my shields on! Still, I'm happy with this elements! This elements just didn't turn out all that well for some reason. I figured the checkered shield would look great, but it doesn't work all that well for some reason... The other two shields are simplified versions of tear-drop shield designs I found; unfortunately there aren't too many example of round shield designs for Early Russians. I decided that I definitely liked bright shields at this point, so these ones are bright. I really like the horses, and I thinkg that Old Glory horses are great. 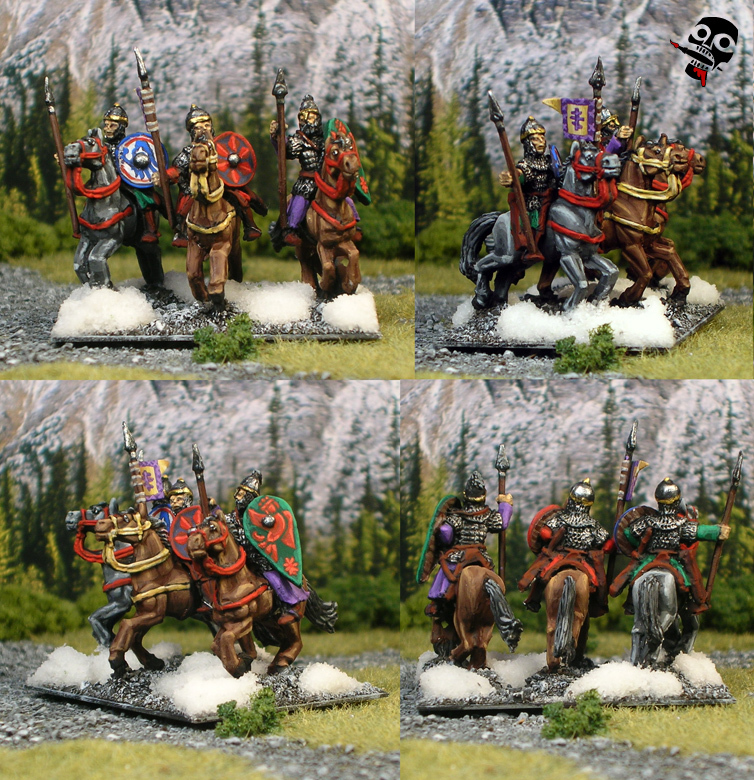 I have only seen one other manufacturer though (museum miniatures), but I think these OG horses rock! 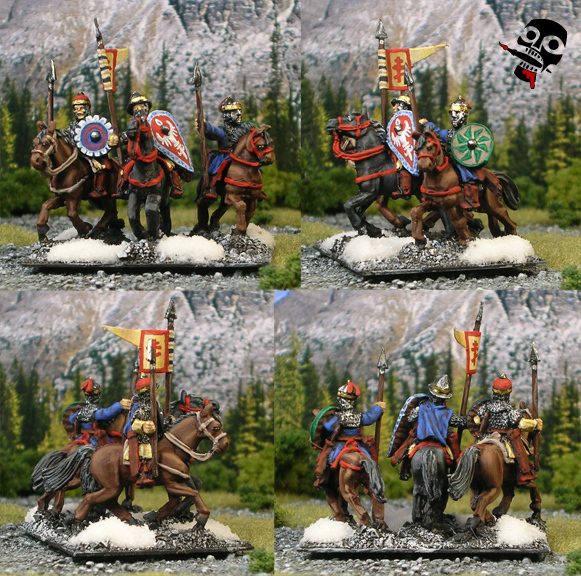 Svoi Pagyane, 'our own pagan' light horse elements for the Russian DBA action! The colours are based on Penechegs from the period. 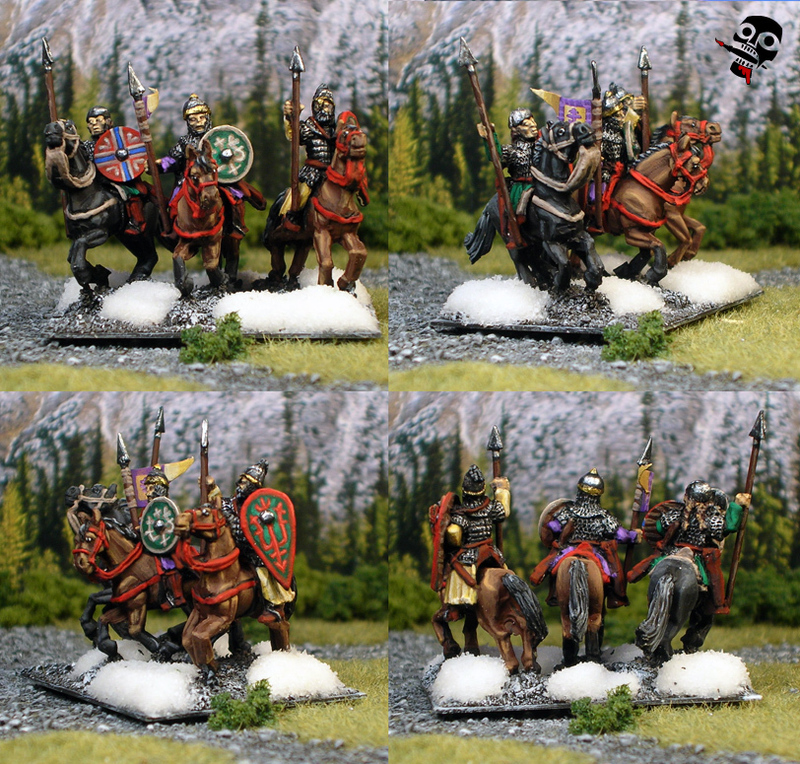 The alignment of the horses on the base reflect the dynamic style of fighting of the light horse skirmishing troops and were facilitated by the poses of the figures, which I like very much! 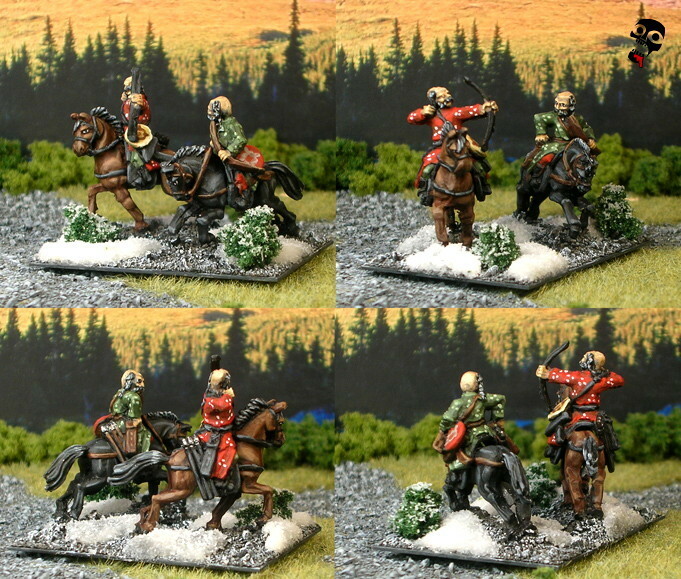 Some Russian polk spearmen, city militia types! I did them in the gawdy multi-colour of the period, but made it all very bright. The shields are largely based on Osprey's images, with the green and white one based on a reenactment shield I saw. I found out I don't really like painting studded armour in 15mm scale though... Still, quite happy with the element and now over half done (in terms of elements anyway). I went with the same shield designs (more or less) on this one as the previous just to keep things simpler for me in painting. Not sure how good it will look with all the repetition, but oh well! Note that I put a woodsman on there, I did it because there wasn't enough variation in the city guard figs for my tastes. But who's to say this woodsman didn't move to the city recently for the job opportunities? 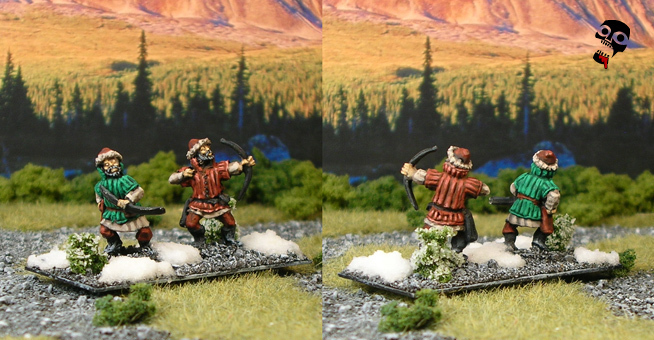 An auxalia unit for the Russians, some woodsmen taking a break from log chopping to do some Swede chopping. 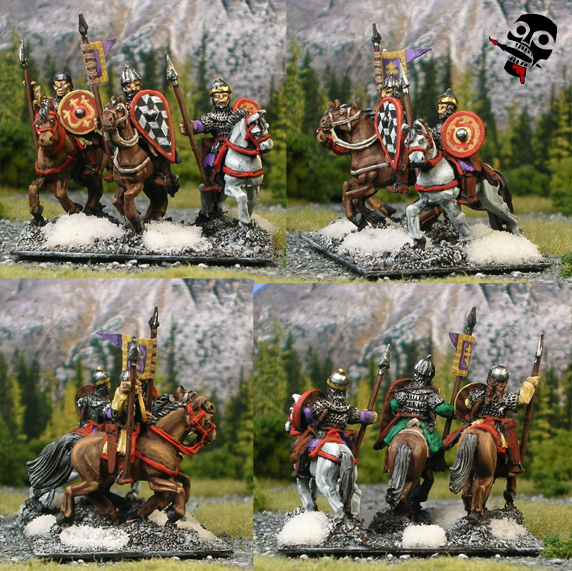 I took great care to paint these according to the colours laid out in the medieval Russian Osprey book! 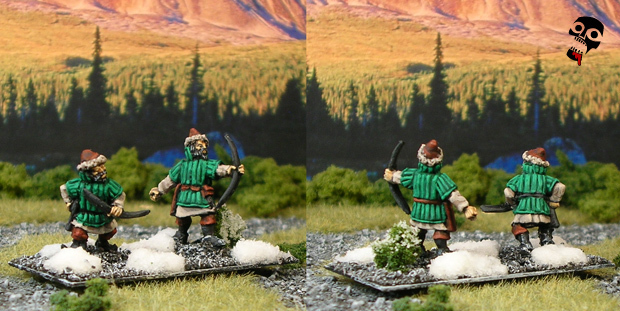 I am happy with it, but i noticed that the figs, especially with the snowy base and it's snow-covered pine saplings, resemble Santa Claus somewhat... In any case, I am very happy with them! 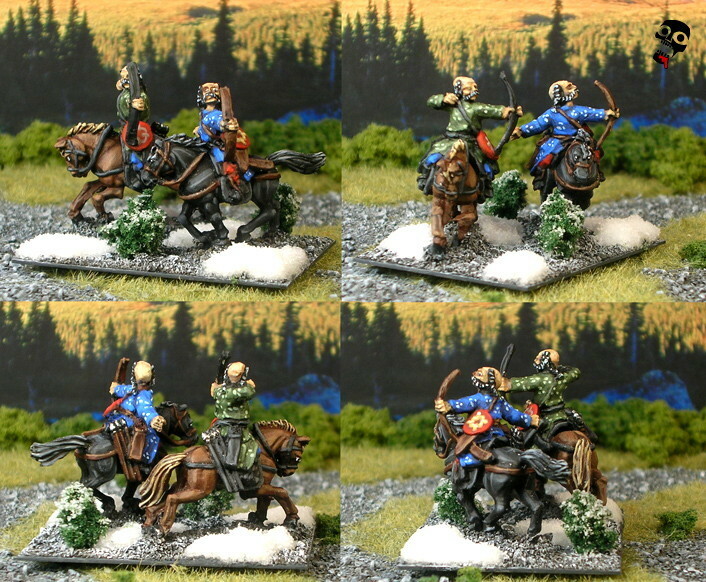 A Psiloi unit here, these are some Russian woodsmen out for a battle in the morning! I quite likely used a green that was a bit too bright for these figs, but overall, I am very happy with them. Their brightness matches the wild colours of the rest of the army! 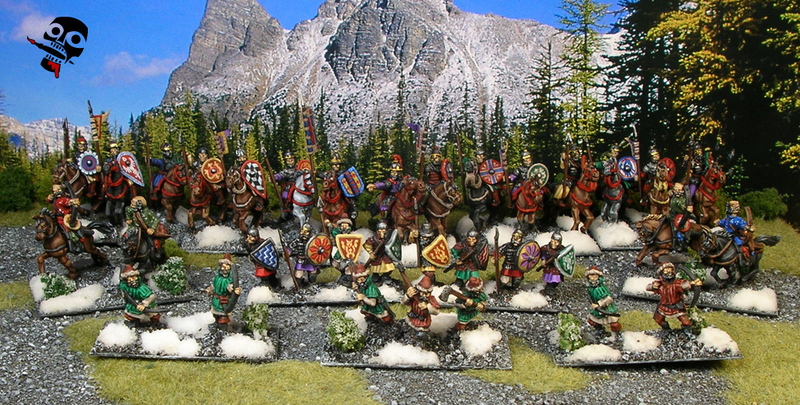 And, these are pretty historically accurate in terms of colour and design! So, Santa Claus looks like them, not the other way around! It was nice to paint specific designs again :) Lions, flying people, etc. It's a bit easier than simply painting designs thanks to the symmetry aspect!